To fix and insulation of heat receiveing portion. Heat transport process for parts. The usual Kapton tape 55 & micro; m thickness of both sides tape body is 120 & micro; m a bit sorry. Since deterioration is not seen as with the usual Kapton tape even when reflow temperature is recorded many times it becomes possible to partly eliminate the need for screwing to change and adjust the position of the tool to be exposed to high temperature , I would like to apply effectively in the future. This review is about item#75181574. 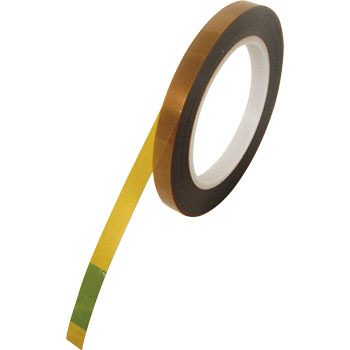 Even if the tape width is narrow, the adhesive strength is strong, and it is very good for the purpose because it is double sided tape. We used it for assembly of electronic parts assembly. This review is about item#75181583. Adhesion and thickness are ideal. Because prices are not surprisingly surprising, we are using it for everyday work with ease. I purchased the price cheaper than the other. There was no problem in use. I would like you to handle tape width only 10 mm, 5 mm, 15 mm width as well.